Where do you think will Vizag Steel Junior Trainee Admit Card 2017 be available for download, huh? Is this the one and the only way? Yes, you heard it right, it is! The Notification demonstrated the “Likely Date” for the Written Test i.e. 9th July 2017 (At Forenoon). Selection procedure for posts named as Junior Trainee (JT) and Field Assistant Trainee (FAT) slightly differs in terms of rounds. In other words, if you registered for JT post, required rounds for you to pass will be a Written Test followed by a Document Verification, while tests conducted for selecting people for the post of FAT includes Written Test, Verification of Certification, Physical Test, etc. To take all the rounds, Vizag Steel Plant JT/FAT Admit Card 2017 would be necessary. The test will be conducted at exam centre (s) at Andhra Pradesh. Your RINL-VSP Hall Ticket will also clear the confusion on VSP Junior Trainee Exam Date and people will heave a sigh of relief. Vizag Steel (also represented as Rashtriya Ispat Nigam Ltd.–RINL) is a Steel Plant based in Vishakhapatnam, the Andhra Pradesh and was formed in the year 1982. It produces “Steel” as per the requirements. We are pleased to remind you that it had made the lots of job-searchers alert about the vacancies of Junior Trainee (JE) & Field Assistant Trainee (FAT) of total 736 posts. Having completed registration procedure, all contestants are thinking to collect their Admit Card for knowing Vizag Steel Plant JE Exam Date which we have already communicated through this educational article. This Written Test will be set in two languages i.e. English and Telugu. Whoever clears written exam gets to the next round which is “Verification of Certification” and then finally for Physical Test in which aspirants will be checked whether or not they are physical fit for the job. The male candidates’ Height should be 150 cms. The Weight of male candidates will be 45 kgs. Chest of the male applicants must be 75 cms. (Unexpanded); 80 cms (Expanded). The Weight of Female contenders must be 35 kgs, whereas the required Height is 143 cms. Applicant, whether male or female, has to bring their Vizag Steel Plant JE Admit Card while taking the test at the said exam centre. It should be noted importantly that no expenses will be given to the candidates for partaking written test. Candidates must not be present at the venue of written exam with any cheating material. If anything suspicious happens, this may lead to the disqualification of candidature. Both tests are going to be held on same date and day (Sunday). The reporting time for JT Exam has been set as 9:00 AM while for FAT it is 2:00 PM. We have also carved the “Test Timings” so that you can know when the exam would start. When you step into the exam centre at above-given timing, make sure you possess VSP Field Assistant Trainee Hall Ticket; otherwise, entry would be restricted. After the conduction of written test, the VSP would like to release “Answer Keys”. There would be no change in the exam centre one chosen at the time of registration. That is why we told everyone to fill up application form very carefully. With day-to-day changing technology, people are confused about the steps to follow to get their Hall Ticket for written test. But, with this informative guide, we believe that you will not have to lose anything – everything will be fine. At first, locate the “Career” option at the RINL-VSP’s Official Website i.e. www.vizagsteel.com. 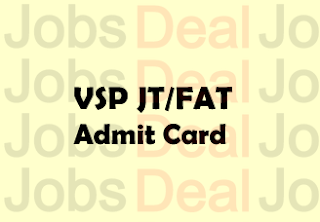 Having found the section, many links related to VSP JT/FAT Recruitment will be shown there. You have to take advantage from the link of VSP JT Hall Ticket. Click on the link and enter all of the asked information with all care. After submission, have some wait. You will be handed over a link which you can use to download your Vizag Steel Junior Trainee Admit Card 2017, but make sure that you are having all information ready that you have to enter while downloading the Hall Ticket like your Username and Password. If you have any question on Login Credentials, please ask in the comments. Do not forget to share this page with your friends.